It’s another holly jolly cocktail for us! 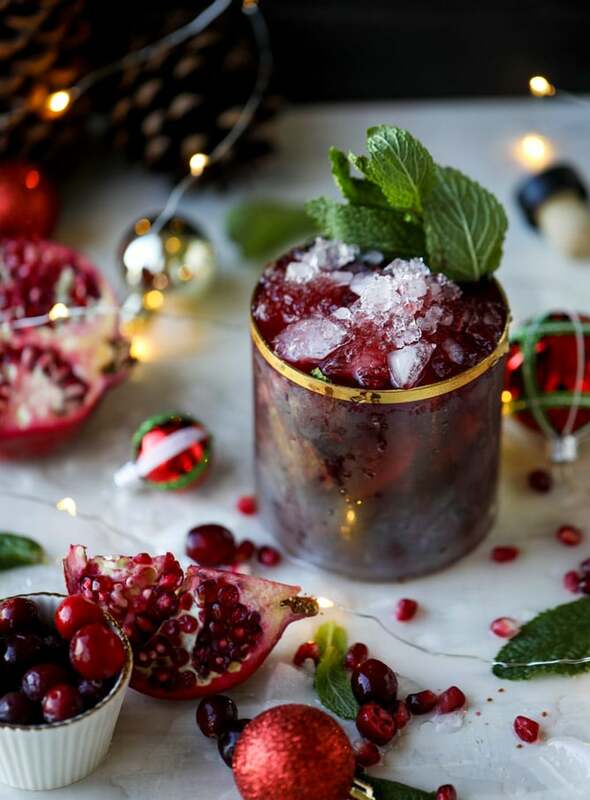 This super festive and fun cranberry pomegranate julep is a tad on the stronger side, for those of you who want something more than a mimosa or a margarita. Something a little EXTRA. So! While I usually consider mint juleps to be a spring cocktail with the Kentucky Derby and such, I actually love the idea of serving them in the winter. Bourbon is just so… warming. You know? 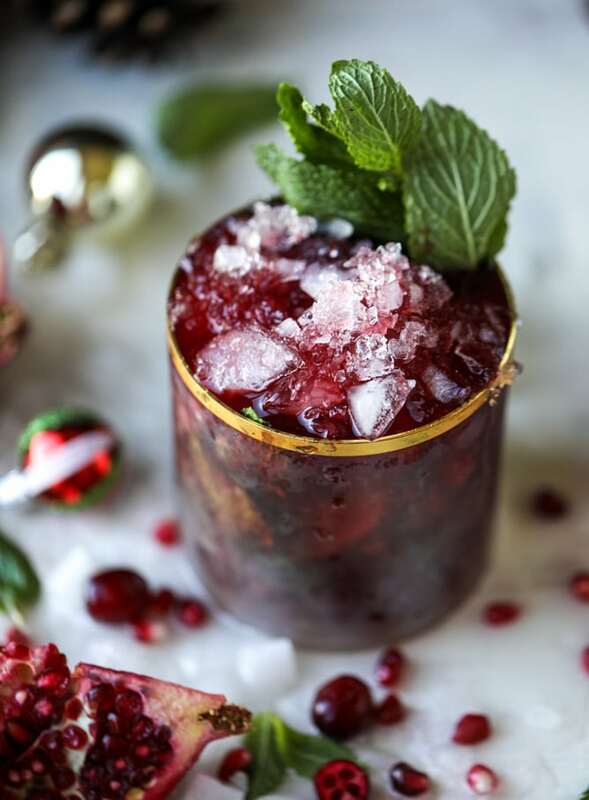 Even though we are pouring it over the traditional crushed iced, it’s still warm and wonderful especially when mixed with the flavors of pomegranate and cranberry. Also, if you’re a major crushed ice lover like I am these are ridiculously crunchy and satisfying. It’s like a grown up slushie. These are SO easy to make for a holiday party. I’d actually suggest setting up a little bar with your pomegranate and cranberry juices in cute jugs and having the bottle of bourbon near. Have a bowl full of adorable fresh mint and then a bucket of your crushed ice! The only thing that will take some maintenance is the ice, but this way, people can construct their own juleps. Because cocktails are certainly something that need to be constructed… eye roll. 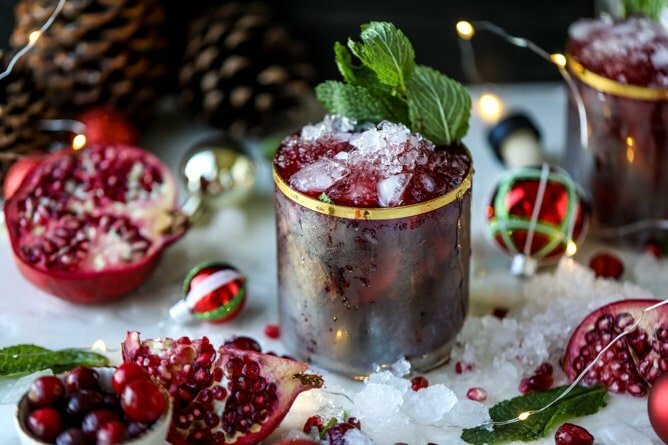 I’ve shared a bunch of cocktails lately that would be wonderful for Christmas morning, but I have to say that this one is much more of a Christmas dinner or party drink. Unless you’re into consuming bourbon first thing when you wake up. Eeeep. But it’s a classy and more sophisticated beverage that can hold up against a roast and fancy snacks. And it’s jewel toned!! I want to jewel tone my life. Like decorate our home in jewel tones, only wear jewel tones. Forever and ever! Combine bourbon, mint simple syrup and juices together in a cocktail shaker with ice and shake for 30 seconds. Pour over crushed iced and serve with extra mint leaves. You can also garnish with cranberries or pomegranate arils if you wish. Doesn’t that just look like a glass of jewels?! I can’t choose which of your cocktails I want to make! I guess I have to make them all? I love Cranberry anything so…. this is on my list Santa! I am SO making this on Christmas! Thank you for sharing! That perfectly crushed ice is calling to me. I know it’s terrible on the teeth, but when it’s just right I have to crunch it. These look incredible, Jess! Want to make them for a holiday party this weekend. Did you use unsweetened cranberry juice? i did! but you can use sweetened if you’d like! I am not a big bourbon drinker, but I think these flavors would be great with either vodka or rum. I’ll report back if (when!) I try it. Made this on the weekend for a holiday party and it was a huge hit! We ended up buying a pre-mixed cranberry/pomegranate juice to make it even easier and people loved it! We ended up making three big pitchers of this. So tasty and perfect for the holidays. That mint simple syrup makes it. 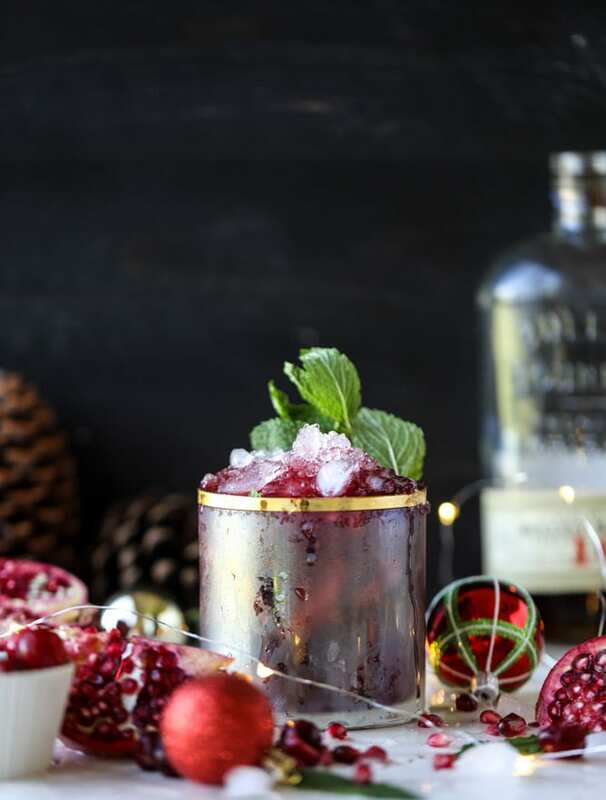 gorgeous cocktail, happy that you’ve “winter-ized” this julep, love the cranberry, anti-oxidant too I think so healing wile drinking, than you!